Forget scarves and mittens. Soon, we might be able to knit entire buildings. A team from the Swiss university ETH Zurich has developed a technique that allows them to knit textiles that can then form the scaffolds for large concrete structures. As a proof of concept, they created a 13-foot-tall architectural structure that’s now on display in Mexico City. 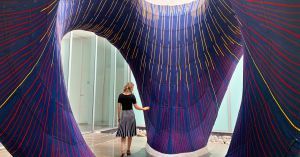 To create this curvaceous knitted concrete structure, the team started by using an industrial knitting machine to produce the textile that serves as its basis. This process produced just four long strips of fabric and took about 36 hours. After transporting the textile to Mexico City, they fitted it over a steel cable-net and a temporary frame, inserting balloons into pockets in the fabric to give it its desired shape. Then they sprayed the structure with a specially formulated concrete mixture. After that hardened, they applied fiber-reinforced concrete. While the textile and net weighed a total of just 121 pounds, they were able to support 5.5 tons of concrete. The Mexico City structure marks the first use of this knitting technique to create a structure on an architectural scale, but it might not be the last.